Dumneazu: Dorel Codoban 1944-2012. Master of the Vioara cu Goarne. Dorel Codoban 1944-2012. Master of the Vioara cu Goarne. Dorel Codoban, the master folk fiddler and instrument builder from the village of Lazuri de Rosia, who was well known as the best builder of the enigmatic Romanian folk violin known as vioara cu goarne, passed away on February 7 at the age of 67. 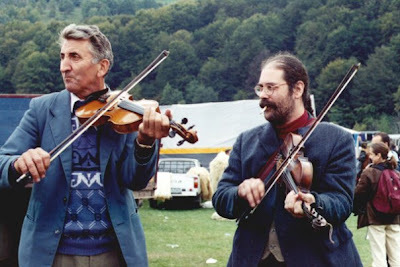 Dorel was more than a simple folk fiddler. 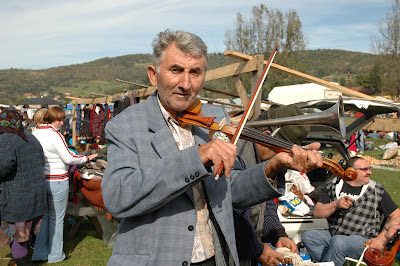 He was the center of a cultural scene that represented his region – the Transylvanian region of Bihor – and the unique regional culture that still thrives in the mountains there. Dorel not only built these unique instruments, he played them and encouraged other to play them, and he made sure that if you played one yours would be in working order. He walked around with his coat pockets full of spare resonators, tiny HO size screws, gramophone stylus jacks, ready for anything and everything that could go wrong with a metal fiddle resonator. Playing at Negreni around 1999. Dorel was good friend of mine, and I looked forward to meeting him each year at either folk festivals in Hungary or at the sprawling peasant market that convenes every second weekend in October in Negreni. I first met him and his family in 1990, at the Budapest Dance House Festival. His group of Bihor folk dancers had been invited to represent Transylvanian Romanian culture, and I wound up recording some of his music in the basement of a sports stadium at an impromptu session that lasted at least two hours, during which we finished a two liter bottle of his famed home brewed Bihor palinka. Later, when his son-in-law Dan and wife Florica came to Budapest to buy auto parts they would stay at my flat. But the best memories of him were always at the Negreni fair. 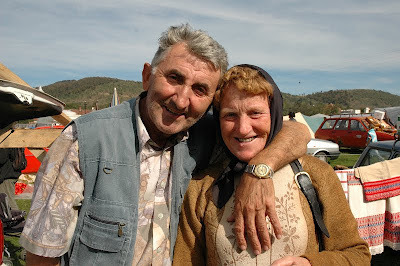 Dorel and Florica would be busy selling shepherd goods out of the trunk of their car – the coarse sheepskin capes worn by shepherds, thick homespun wool winter coats, and, of course, the vioara cu goarne fiddles that drew the most interest from curious foreigners.Pretty soon a knot of fiddlers would gather around, a drummer would appear, and Dorel would lead the band around the fairgrounds to the beer tents. Vioara cu goarne are extremely loud instruments, and you could hear the thin metallic outpour of sixteenth notes from a half kilometer away. They are also very focused instruments – since the metal resonator is directed into a bugle bell, it is loud only in the direction you point the trumpet at. Fiddlers habitually swing around while playing, creating a kind of Doppler effect, a natural wah-wah pedal depending on where the bell is aimed at. To counter this, fiddlers often played in pairs or trios, pointing their fiddle horns in different directions. Like other resonator instruments, such as National guitars, they are loud but their sonic profile is extremely hard to mike correctly – they are natural feedback machines near a microphone. And if you are playing one, the trumpet is pointed away from you, so you can hardly hear what it sounds like when you play it, making it frustrating to record in a studio. I know – I have tried many times. Dorel was well known as a craftsman who dared to take chances designing his fiddles. Dorel's fiddles. I own the older one pictured here. 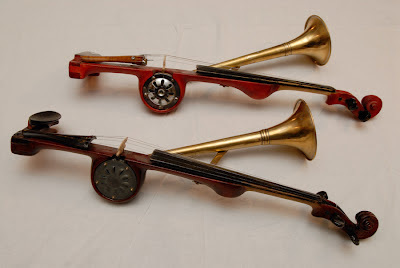 At the request of a French musician, he began making fiddles with two horns (Pom Collins actually has one of these monstrosities)and fiddles using mica sheets for the resonator (instead of the usual sheet of beer can stamped flat using one of his specially made brass hammer presses. Some builders also liked to use the sheet metal from energy drink cans, claiming the tone is more energetic .) Dorel was constantly on the lookout for old gramophone Victrolas to scavenge for parts used in the making of the resonator mechanism, as well as old bugles dating from the era when Communist boy scout troops always employed a bugler. No more communists meant no new bugles, so Dorel experimented with sheet metal horns, used horns from camion trucks, and eventually, bugles ordered directly from a factory in China. When I first moved to this part of the world in the late 1980s, I was anxious to collect and learn the local traditions before the modern world swept in and replaced all this homemade traditional music with the commercial barking of globalized pop. 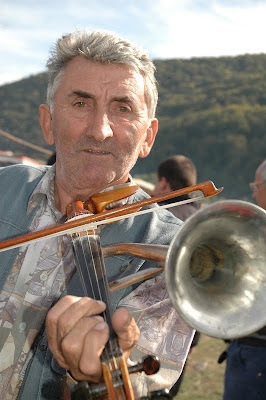 Luckily, some of the tradtions are still strong, particularly in Bihor, where the trumpet fiddle has been adopted as the acoustic symbol of the regional obsession with the Oradea football team. Because of this, Youtube videos I have put up of Dorel and other Bihor fiddlers have immense viewer statistics that would make any indie pop band jealous. But with Dorel’s passing I know of only one other reliable maker of vioara cu goarne: Mircea Rostas and his son Adi in Bratca. There are lots of players, to be sure, but fewer makers. One of my fondest memories of Dorel was the trip we took from Negreni to Oradea, with Camille and Dejan in tow. During the trip we played the unsold fiddles that Dorel had brought to the fair as a fairly large group of Gypsies and peasants gathered in the hallway of the train, drinking beer and dancing. As you can tell in the video, we were pretty well though a Pepsi bottle of the good stuff as well. The next morning in Oradea Dorel was tremedously hungover, but that changed the moment he got in his folk costume. Dorel and Florica led the Rosia dance troupe in the annual Bihor folk parade through the streets on their way to a folk festival in one of the city parks. You can see the pride in place that these people have, something Romanians really treasure, a sense of home and hearth and continuity that transcends a single lifetime. Dorel gave us something, he gave his culture something, and he gave his family something very special. He was a good man. And I will remember him everytime I hear those tunes. And Although Dorel has passed on, I will go back, because it is not just music that draws me to Transylvania, but the people. The ones I can proudly call my friends. I've been on the lookout for a viora cu goarna for a while, they come up on okazii.ro occasionally but no-one will post abroad (I'm in Britain). Any help in finding one would be gratefully received. R.I.P. Mr Codoban. Sad news indeed. I have a documentary on him - he was a really down to Earth guy. I just crossed a street musician playing one here in Bruges, and talked to him about Codoban. so sorry for his passing. the entry is beautiful tribute - thanks so much for writing it. I was told to contact you by Joris van Beek from Ot azoj. I am a fiddle player living in budapest right now. I am learning hungarian and romanian folk music and play in a swing and folk band. I was thinking of getting a trumpet violin, and there are some here in budapest at a folk store, they are about 400 euros, but i dont know if they are good or not. Also do you have recommendations for folk camps this summer? to be honest, that instrument is kinda weird but i still want to hear its real sound..